For the past several years on New Year’s Eve, my friend and her husband have hosted a small party at their house. It’s a pretty chill night filled lots of socializing, eating, drinking, Wii, and board games. (Writing that made me feel old, jeez.) And each year, I of course bring dessert. Since I’ve been sick this week, I almost took the easy route and made S’mores Pies. 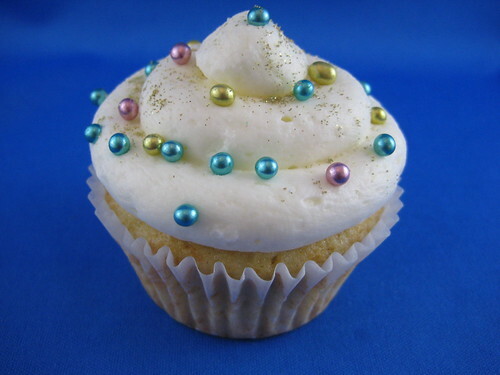 Then I realized that was stupid and decided on champagne cupcakes. Fortunately for me, I only looked at a couple of recipes before deciding on this one. The original recipe called for a pastry cream filling, but since I’m not a fan of pastry cream and I was feeling lazy, I decided to leave it out. Note: I know absolutely nothing about champagne (except that I like it), so I asked a couple buying champagne at the store if they would help me. This guy directed me to a $5.99 bottle of Barefoot Bubbly Moscato that said “Deliciously Sweet” on it and told me it would be great for baking; his husband made it clear it was not suitable for drinking. 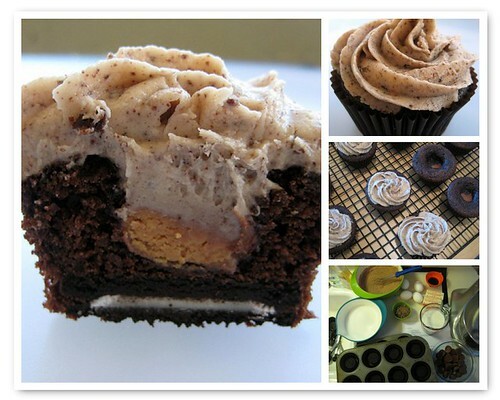 Point taken, and it worked great in both the cupcakes and frosting. In the bowl of a stand mixer fitted with the paddle attachment, cream together butter and sugar until light and fluffy. Add eggs one at a time beating well after each addition. Add vanilla and mix. Whisk together flour, baking soda, baking powder and salt, set aside. In a medium sized bowl, whisk together 1/2 cup champagne and 1/2 cup sour cream (mixture will fizz and bubble a little). Add flour and champagne mixture alternately, beginning and ending with flour. Batter will be thick. 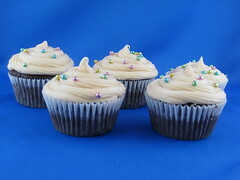 Fill cupcake papers with 1/4 cup level measures of batter. Bake for 17-22 minutes. Let cool. Yields 18 cupcakes. Did you know last Friday was Sugar Cookie Day? Neither did I, until Thursday afternoon when two coworkers hinted at it. (This is what happens when you’re the coworker with the baking blog.) Not wanting to let anyone down, and always up for trying a new recipe on willing guinea pigs, I decided this was the perfect opportunity to test the sugar cookie bar recipe I’ve had bookmarked for a few months. I love sugar cookies, but they’re a pain–you have to roll the dough, cut the shapes, then frost each individual cookie. 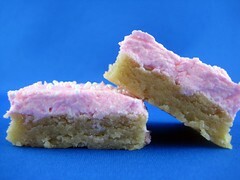 That is why sugar cookie bars are such a brilliant thing! No rolling or shape cutting–simply put the dough on a cookie sheet, bake it, then frost and slice the giant cookie. Simple! Flavor-wise, I really like the cookie. The frosting was not my favorite (I like a glaze or cream cheese frosting on sugar cookies), but it was a HUGE hit at work, so it may be best to ignore my opinion. My coworkers especially liked the cookie to frosting ratio, which was about 50-50. 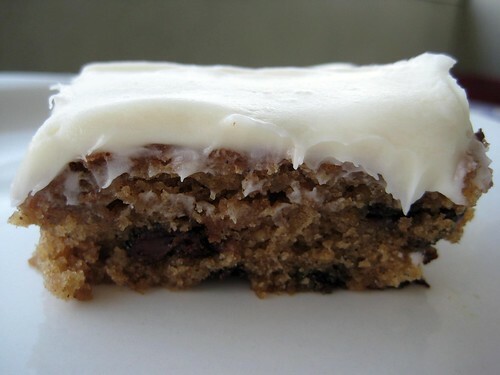 Overall, these were a tremendous success and I would definitely use this recipe again. Preheat oven to 375 degrees. Grease a 13 x 18 inch sheet pan and line with parchment paper. In a medium bowl, combine the flour, salt and baking soda and set aside. In the bowl of an electric mixture, cream together the butter and sugar until light and fluffy, about 3 minutes on medium high. Add the eggs one at a time, mixing after each. Add the vanilla. Add the flour mixture in 2 addition, mixing until just combined. Press the cookie dough into the sheet pan, using a greased spatula or parchment paper to spread it evenly. Bake for 10-15 minutes until lightly golden and a toothpick inserted into the middle comes out clean. Cool completely. In the bowl of an electric mixer, cream together the shortening and butter until combined and smooth. Add the vanilla and salt and mix until combined. Add the confectioners sugar 1 cup at a time, mixing after each addition. Cream together on medium high for about a minute. Add the milk 1 tablespoon at a time, mixing until smooth. Spread onto cooled cookies. Slice into bars and serve. Recipe from And Now for Something Completely Delicious.